In part 1 we looked at our new products from our established brands – some of which have been with us from the beginning, and always have something new and exciting to offer for each season! But we are always on the hunt for new brands to come aboard our rather colourful ship, and help us continue to offer our customers something a little bit different from other stores. This spring, we have invited seven new brands to join in the Red Candy adventure, and we think you might just love them!! We’ve particularly been looking for products that make storage fun, and have found just that! Our new range includes quirky mini animal wall hooks, Lego brick storage boxes, copper wire storage racks, and mountain-shaped shelves. So sit back, relax, and let us take you through our hot new 2017 brands! The Zoo is a fun-filled design brand from Amsterdam. Bringing together a colourful menagerie of animal themed home accessories, this quirky collection is guaranteed to delight everyone – both young and old! 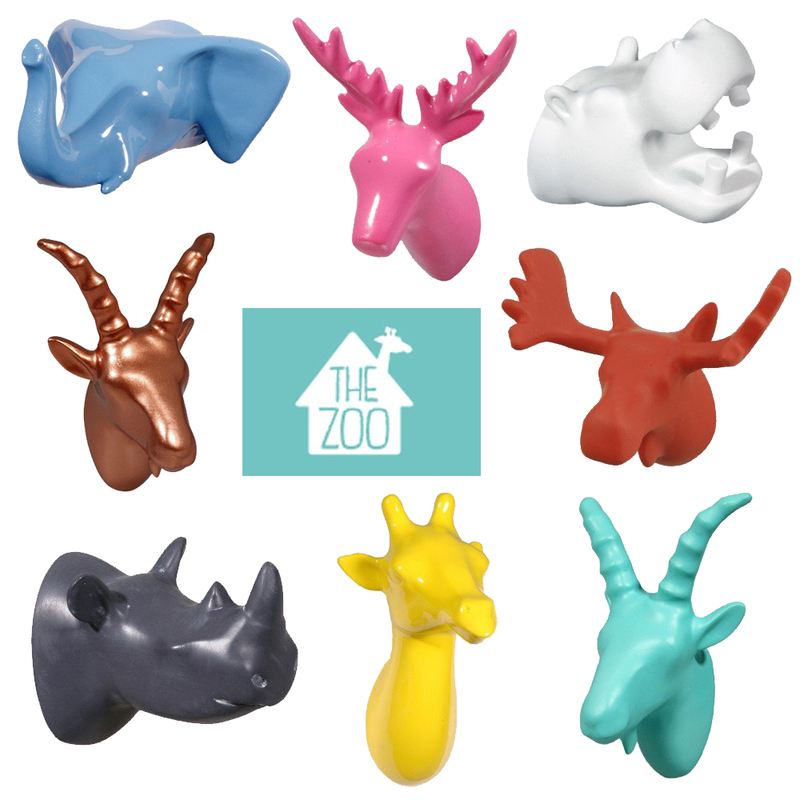 We love their mini animal head wall hooks by designer Jorine Oosterhoff, which come in a range of matt and glossy colours! A modern take on the animal trophy head design, these characterful creations are a unique way of getting your home organised! PUIK Art is a Dutch design brand that aims to challenge convention with bold designs, innovative production methods, and the use of a variety of materials. Continuously pushing the boundaries of creativity, the creative minds at PUIK Art firmly believe that contemporary design should challenge the status quo. They work with young, up and coming designers to create stunning designs which are accessible to everyone. Bitten Design has been proudly turning fun ideas into delightful home accessories since 2008. From their colourful Balloon Dog Lights to the Plantosaurus dino planter, all of Bitten’s versatile designs have been created by designers who have their tongues firmly in cheek! Korridor is a creative contemporary design brand, which exists to be inspired and to inspire others. Their ethos of creating a bridge (corridor) between art and commercial interior design is reflected in their name. Founded in 2013 by Danish architect Henrik Ilfeldt, the designers at Korridor spend their days experimenting with – and developing – new ideas. Check out their vibrant Pyramid Storage Boxes below – an original and colourful solution to clearing the clutter! My Mountain Boutique‘s products are inspired by the beauty and wonder of mountains. They specialize in supplying independent and handmade designs that are lovingly crafted and and focused on the highest quality. From bookshelves to coat hooks, My Mountain Boutique offer unique and original designs for your home. Build some fun and creativity into your storage with the Lego Storage Bricks! These official Lego licensed products are shaped like oversized Lego bricks, and come in two available sizes – the square 4 stud brick and the rectangular 8 stud brick. Lego was founded in 1932, and its name was derived from the Danish phrase ‘leg godt’, which means “play well”. Well now you can “store well” as well, with these cheerful storage boxes! With the inclusion of the studs, these fun-filled boxes can stack just like the original mini building bricks we all know and love, and can hold anything from toys to trinkets. Puhlmann is a designer label from Amsterdam with a wide variety of interior accessories. The range varies from magazine racks to colourful stools; made and designed by talented designers. The variety of the product line provides a challenging and creative combination of design and functionality.